I have recently been asked a lot more frequently about cleansing brushes and what devices I recommend for home use to cleanse the skin, support healthy exfoliation and help their skin glow. Well, I’ll be honest, I used to use a battery-operated cleansing brush (Clarisonic) but after disappointing results I swapped it out with the My Skin Buddy device. Unfortunately, most battery-operated cleansing brushes are too rough and aggressive for your delicate skin (even with the most delicate or sensitive head) and most people make them even more aggressive by applying pressure to the brush as it vibrates over your skin. That “purging” that people often experience is actually an indication of damage being caused to the acid mantle of the skin. It is a sign of inflammation within the skin. This device is often sold with very little education about how best to use it. This leads to most people using it incorrectly and then causing more harm to their skin than good. Another way that these devices cause damage to the skin is that most people fail to properly cleanse or sanitize the brush head after each use. Even if letting it dry completely between uses, bacteria still thrives amongst the bristles, especially if you store it in the shower. I suspect that in a few years we may start to see an increase in broken capillaries, stubborn ‘bumps’ that don’t come to a head and rosacea related to the use of these brushes. Since relegating my Clarisonic to use on my body and no longer putting it anywhere near my face, I have started using the My Skin Buddy. This handheld LED light therapy device that features 4 advanced technologies: LED light therapy, positive and negative ions, ultrasonic vibration and thermal therapy. The beneficial wavelengths of Light Emitting Diode Therapy have been proven and shown to improve the appearance of fine lines and wrinkles, fight bacteria that leads to acne, reduce redness and promote brightening and even skin tone. Gently, yet effectively, positively-charged ions work to attract and pull impurities from the skin while negatively-charged ions enhance product penetration. The power of 8000+ ultrasonic vibrations per minute, the user is able to enjoy a soothing mini massage while breaking up dead skin skills, lifting, firming and tightening the skin. The combination of heat with the deep cleansing ions aids in emulsifying dirt and oil so that it can easily be swept away. Thermal heat therapy has also been shown to improve with skin tightening, promoting more oxygen to the cells by improving blood circulation and shrinking pore size. Because this device does not have any bristles, it is easily cleaned and sanitized with the simple swipe of an alcohol pad. 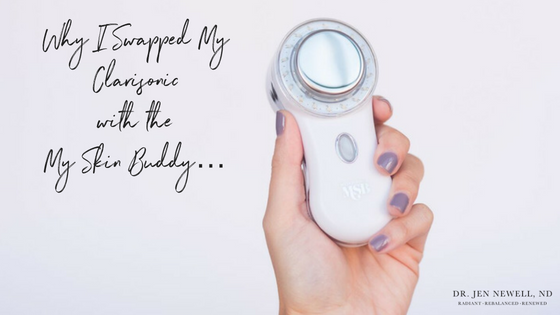 I prefer the My Skin Buddy because it offers more than just simple exfoliation and it is much gentler on the skin while delivering more results. Not only have I been using this device at home as part of my skincare routine but it has become a valuable tool used during in office treatments to help my patients achieve the results they desire in their skin. For those interested in purchasing a My Skin Buddy please feel free to contact me. It really is a fantastic addition to your skincare routine.